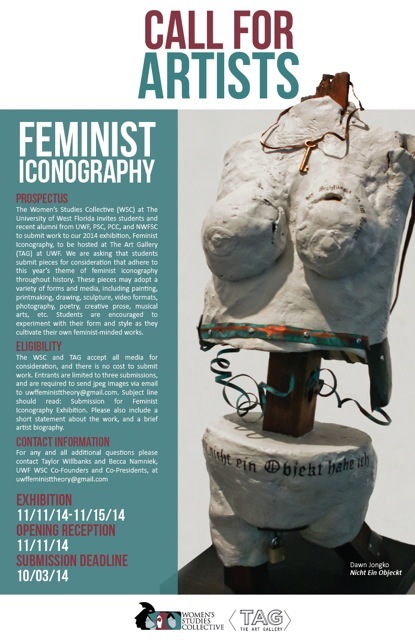 The Women’s Studies Collective at the University of West Florida is partnering with The Art Gallery (TAG) at UWF to host our first-ever art exhibition, _Feminist Iconography_, to be held November 11th-15th, 2014. At this time, we are asking students and recent alumni from various institutions across the Southeast to submit pieces for consideration that adhere to this year’s theme of feminist iconography throughout history. These pieces may adopt a variety of forms and media, including painting, printmaking, drawing, sculpture, video formats, photography, poetry, creative prose, musical arts, etc. 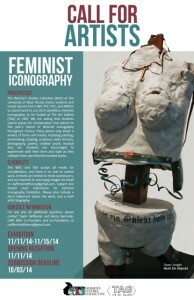 Students are encouraged to experiment with their form and style as they cultivate their own feminist-minded works. The WSC and TAG accept all media for consideration, and there is no cost to submit work. Entrants are limited to three submissions, and are required to send jpeg images via email to uwffeministtheory@gmail.com. Subject line should read: “Submission for Feminist Iconography Exhibition.” Please also include a short statement about the work, and a brief artist biography. Electronic submissions are due no later than October 3rd, and approved artwork must be received by WSC representatives on November 3rd, 2014. If selected for display, artwork must be packed in reusable containers and delivered to 11000 University Parkway, Building 50, Pensacola FL 32514. Work may also be hand delivered to the care of the Women’s Studies Collective on the second floor of building 50 on the UWF Pensacola campus. Art work must arrive ready to install and artists must supply diagrams/instructions if necessary and any related hardware. Return shipping will be provided, including insurance, by TAG.